Very friendly. 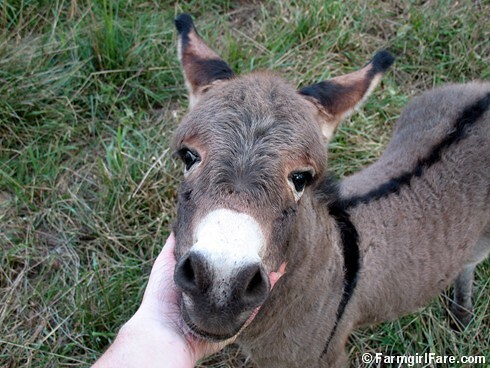 Like the third time I went out to see him (when I took these photos) he practically ran over to me wanting to be pet kind of friendly—unlike Dinky and Fernando, the other donkey boys born on the farm, who never let me pet them. Ever. Like the thought that, "We could actually keep him if we got him fixed," has been said aloud kind of friendly. Like someone around here may have been overheard saying in a cutesy little very manly voice, "If you're gonna stay, you've gotta be friendly with everybody, buddy, including me," kind of friendly. Like that same person may have just gotten back from hauling water out to the donkeys, and when asked if the little donker was okay, replied "Yeah," with a great big grin on his face. 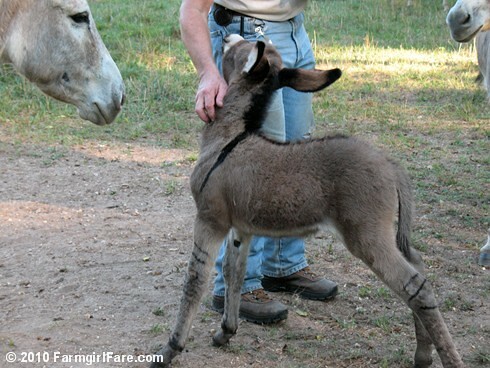 And he may have also casually mentioned that he's started getting the little guy used to a halter. Meanwhile, someone else around here may have casually mentioned to her foodie mother in an e-mail message the other day that there was talk about keeping the little boy donkey and getting him fixed, and if we scheduled it for the same day the vet comes down to fix Donkey Doodle Daddy (who is definitely going to be de-jacked soon), we would only have to pay one farm visit fee. And the mother may have written back, "I will pay for you to be able to keep the donkey boy. He is just TOO cute!!!!!" with that many exclamation points actually in her message. 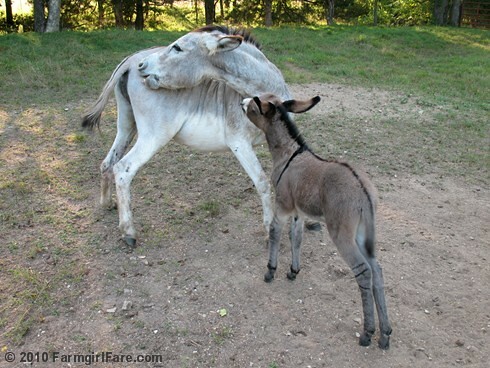 Another e-mail message may have been sent to a bad influence best pal mentioning what the mother had said, and the pal replied by saying, "You should keep the baby donkey—for the blog, of course." This is the year all baby animals born on the farm get names that begin with 'G,' and yesterday I was informed that the little donker definitely responded more to Gus than Gustav. Gus? Gustav? Garth, Gareth, Garry, Gus, Grady, Gangsta....ok, maybe not the last one.....but darn he's ssoooo cute!! I love him ! I have finally started working on paintings of other animals, besides dogs. On my easel, a goat & a bull. Hoping to try to paint donkeys soon. Thinking of you, Joe & all the critters. Sending love to Robin at the bridge. I think of her often. And he sure is cute. Is it weird that I think you should name him after my son? Oh my what a darlin' boy. I vote for Gams as well; a perfect name for such a delicious fellow. I really love his markings! Will they last?? Adorable! I vote for Gary. How about Garret or Granger. But you know he will pick is own name. He is pretty smart. He has already scoped out just who he needs to impress to stay. He is adorable and a good personality goes a LONG way toward getting to stay (once that kindest cut of all is completed) . Guster - a windy sounding name incorporating the Gus part and sounding little more manly for his grownup years. Wonderful markings - will the stripes on his legs remain? 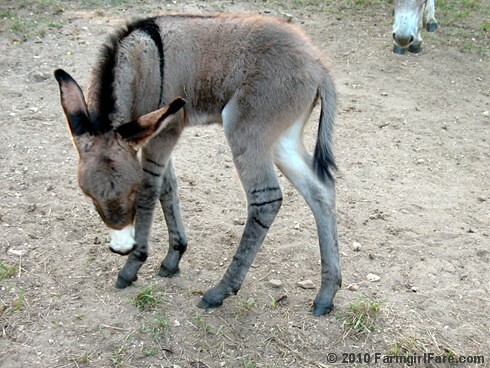 He's not just cute, he's one fine-looking donk. P.S. My word verification for this comment is "geolly". Another "g" word. Maybe you could name him "Golly" as in "Golly gee, he's cute!" What a lovey boy!! Too adorable for words. Things may be looking up, Farmgirl. How about this heat? Are we not ready for autumn! I was thnking just the same thing, before I even read down that far, that if you got him neutered he could stay on the farm. He is adorable and for him to be so friendly too, you couldn't possibly let him go. I think he looks like a Gorgeous George, George for short. He is absolutely gorgeous...just love those markings. He is so CUTE! And those ears! Yes, he should stay! I like Gus...he looks like a Gus to me. But whatever name you choose, it will be fine for him...what a guy! So much personality and a bit of ham for the camera! 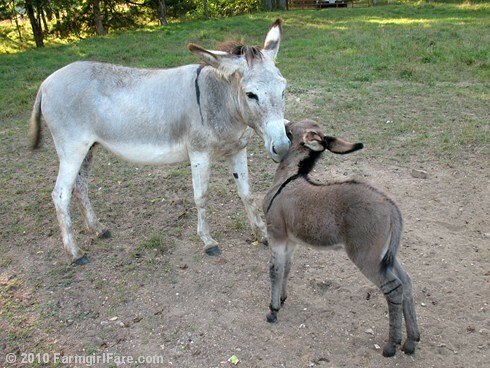 My love of donkeys manifested itself yesterday when I received a wonderful gift (It is at my blog.) Not a real donkey but enough to make me smile! He surely qualifies for a "dose of cute" I know a very manly Gus which is my first choice but there is Gabe, Garr, Gareth, Gavin, Gil, Gunnar or Guenther. He surely qualifies for a dose of cute. My first choice for a name would be Gus. I know a very manly Gus. There is also Gabe, Garr, Gavin, Gil, Gunnar, and Gunther. George! Also, ADORABLE. I love him. I vote Gus! It is a friendly name for the little guy. I like Gus. Gabe is a good one too, and you could use his full name when he was misbehaving. Oh, but he is cute and destined to stay on the farm!!!! Gomer would be a nice name - he reminds me of Gomer Pyle. Looks like a Giles to me. I knew a Giles once. Sweet guy. I don't know if he was as cute as your guy though. I like Gus. 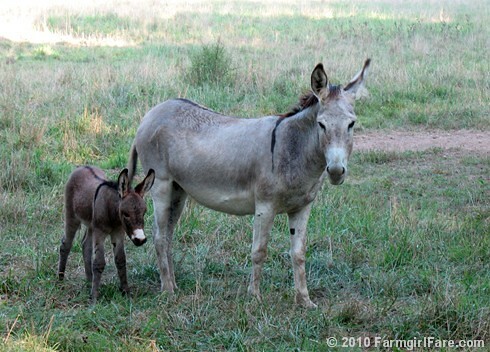 He is an All-American Donkey. Very cute now and very handsome later, I bet. His markings are wonderful? Will he keep them? I think you should call him Garner! he is soooo cute - i'm glad you are thinking about keeping him. Gus, definitely Gus. 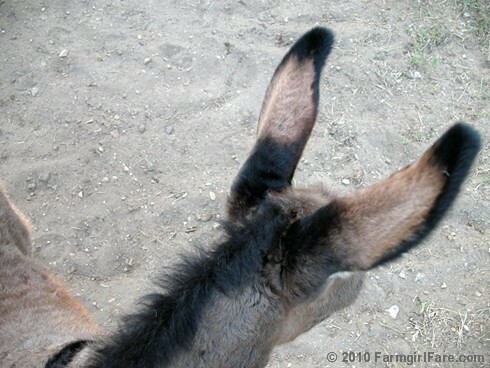 Donkeys can't hear the letters of Gustov, he'll just get confused. "Was that me you were calling? Or was it a yawn?" A definite yes on keeping him. He's adorable. Gus - I like that!! Too cute. Oh YES< he must remain a member of the Foodie Farmgirl family....I vote for George....as in Gorgeous!..His markings are just so different, and those ears! Wow. What fun.....now, I don't mean that he should steal DDD's thunder, as he is still THE MAN!! Ah, what joy comes from every visit here. I vote for goober. He is awesome!! Who couldn't love that face! How's about Giles...my grandfather's name...and he could be a bit of a donkey at times! Gus is a perfect name for him! You definitely must keep him, he is one of the cutest little beings I have ever seen (besides your lambs of course!) I am lucky I don't live close by as I would absolutely want to buy him from you. What a life you live!!! I love his markings. I think you should keep him too. Keep me posted. Those ears? I'm friggen dyin' here. I want to see him on this blog for a long, long time. I am not going to help you. In fact, great minds think alike. Before I read a word of this post beyond, "It's a Boy," I thought, "Oh no, they can't keep him." he was born in AuGUSt. I love the name Gus! I like "Granger". As in "G" on the "range(r)". Also, Granger is just a good solid name. "Here we go Granger, here we go..." thinking sport chant. Though it's really "Here we go Rangers, here we go..."
I think he looks like a Geordie! There's always Gonzo! He is so adorable! I also like Gideon, which someone else suggested. I really like the name Gus as well. However, as 'Gus' doesn't seem to like it and he has to live with it, what about trying out 'Garp' on him? (As in "The world according to..."). He does seem to have come into this world with quite a determined point of view. Gottlieb? Or how about Goober's cousin on the Andy Griffith show- Gomer? I think Gus is a good name for him. He's sooooo cute! Love those markings! Gams is a good choice, too! 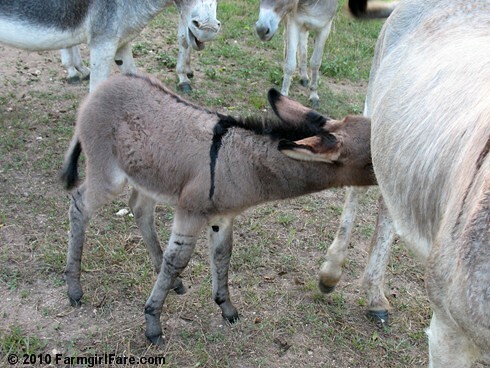 There are some miniature donkeys down the road from us and I was soooo hoping there would be babies this year. 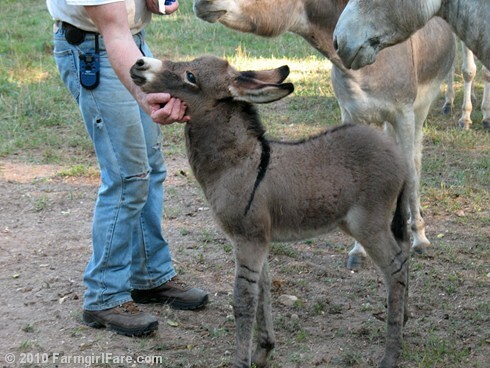 I can't get enough of the spindly legs and big ol' ears of baby donks! As for names, I like Gus or Guster a lot, and also Gizmo and Gilligan. I think Gavin is a cute name for a cute cute cute boy! Ah, dying to come and cuddle with him! Thanks for sharing! Well you know I like Gus just fine but he's obviously thinking of something else. And I thought about Gary (my really dear brother in law's name) but then I was looking at the picture of him and you snuggling and it leapt out at me: Gulliver! Gallagher, Galen, Gaddy, Gad-a-bout,Guiberto, Gonzo, Goofus. I vote for Gus Gus, like the little mouse from Cinderella. It takes the name Gus, which I love, and makes it twice as cute! I swear Gus has some zebra in his lineage. Love those stripes! And what a face!! I'm ecstatic that he gets to stay "home." Gregory. A handsome boy like that deserves to be named after Gregory Peck. Just look at those brown eyes. Ha! You've already aptly named him, and it's in the title of your post! "Gee," which also happens to be a phonetic play on the letter "G." I think it it works out. If not, I second Glee, because he seems to spread that wherever he goes! What a cutie! I think you should name him Gumption and you can call him Gump (like Forrest) for short! So cute! Gams is cute but how about Geoffrey? How about Grayson? I also think Gomer would be cute (and very country). George & Gilligan are interesting names too. Grover, maybe. Naw, Gomer is better. how about the hip baby name grayer. or grayson. gibson, gerald. gerome glenn? Galileo, cause he's a star. I think he looks like a Gryffin. Or a Griffin. Ooh or Grover! Gus is a good name, but also thought of Gilly. It has a little bit of an Australian flavor to it. Some have suggested Gil, or Giles, but not Gilly. Have read your blog for many years, basically have not commented, was very sad about all the hard times this summer, hope fall is a better season. That's it! Susan, I want to come live on your farm, snorgle baby donkies oh and help with the chores too! !